Written by the Founder of TCA, Inc. Welcome! You are at the entrance to the 2019 Traditional Cat Association, Inc. Annual Purebred Cat Show and Purebred Kitten Show, in addition to the Household Pet Cat Show and the Household Pet Kitten Show. We welcome your corporate and individual show sponsorship as well as your participation in the show. This is the place where you can get the information to enter your kitty cat into our shows so all can view your special cat. Don't forget to email your photos with your name, your cat's name, and class number for the file name to diana@traditionalcats.com GOOD LUCK! for your entries via Paypal. 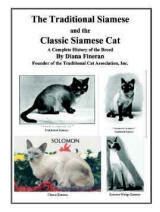 2019 Traditional and Classic Cat Review - Purebred Cat Show Packet - All Documents (in PDF format). Purebred Electronic Entry Available - we prefer your photos electronically. 2019 Household Pet Review - Show Packet - All Documents (in PDF format). HHP Electronic Entry Available - we prefer your photos electronically. ALL RIGHTS RESERVED © by John & Diana Fineran - Aug 1999- 2019.
without the expressed written permission of John or Diana Fineran - No exceptions.